Maskwa Racing: Port-to-Port Boat of the Year, and more Mac info! Well, getting ready for the Big Race! There is a link on the right for the Race to Mackinac Tracking website, if you are so inclined to use it. Check it out! (No, really, check it out!) Really interesting, and you can see that we are already broadcasting! Maskwa is in the harbor at BPYC, and it already is turned on. Coolio! O.k.. The Mac is just around the corner. The boat is ready, the crew is ready, all we need is food and wind. We can relax, though, because Judi is bringing the food, and 2 different weather sources are predicting either - 18 kts out of the south, or 7 kts out of the north. Considering that they all use NOAA for their weather, it is VERY VERY reassuring to know they all agree. Also... We have 4 races complete, and 3 to go for Boat of the Year, Port-To-Port. Here is the big news, as you can see based on the accompanying chart; Maskwa is currently comfortably in SECOND Place. Yup, you read that right. 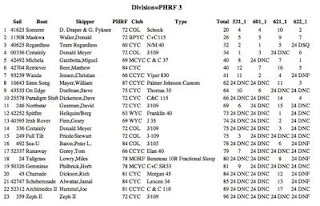 Apparently, Regardless managed to get DSQd from the Waukegan-Chicago race, so that catapulted is into 2nd place, and we are only 6 pts behind Sorcerer. We can easily make up those point on the Tri-State. Three Races, all 3 of which we can do very well at. Those of you who are friends of ours, watch The Mac from above, cheer us on, and wish us well. We're headed up the lake at 1:00 PM tomorrow, and it is a one way trip.